We all know a wedding involves a big white dress and copious amounts of alcohol after the service - but in other countries, white is only worn at funerals and smashing glasses happens during the ceremony rather than afterwards. Here's a look at the significance of some of the world's most important wedding rituals. Lavish dresses and decoration aren't on the agenda at a Jewish wedding - it's all about celebrating the couple's commitment to one another, the sanctity of marriage and the building of a life together. The mothers of the bride and groom smash a plate before the service begins, to remind the happy couple that their relationship is just as fragile and difficult to repair if broken. 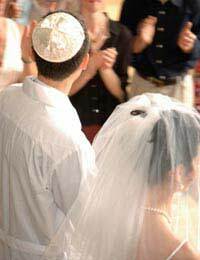 Unlike Western tradition, where the groom lifts the bride's veil away from her face as a symbol of possession, it's customary for a Jewish groom to cover his bride's face before they wed. The veiling serves a dual purpose, indicating a lack of emphasis on physical beauty as well as the groom's commitment to providing for his new wife. The ceremony takes place under a chupah, or canopy - a sheet of cloth held up by sticks that represents the couple's new home. The open sides of the chupah symbolise hospitality for all who enter. During the service, the bride walks around the groom seven times, establishing 'walls' for the pair's house. Muslims do arrange marriages for their offspring, but it's the groom's family who goes looking for a suitable bride, rather than the other way round. Once a lady is found, the families exchange a contract, which includes a dowry - a specified amount of money or goods paid by the groom for his wife-to-be. A number of ceremonies take place before the big day, including an exchange of rings (which also involves fruit and sweets being given between the two families), the sending of wedding jewellery to the bride and the all-important manjha ritual. A couple of days before the wedding, the bride is anointed with turmeric paste and her hands and feet painted with henna in elegant mehndi patterns by the unmarried female family members. The bride wears yellow clothes and no jewellery for the occasion. On the day of the ceremony, a procession of family and friends follow the groom down to the venue, where he drinks sherbet with the bride's brother as a gesture of friendship. Guests are welcomed by the sisters of the bride hitting them with a flower-covered stick - well, it's probably more practical than a bouquet. Again, head-covering's an important part of the proceedings, but it happens after the formal marriage service and celebratory dinner. A dupatta, or long, scarf is used to cover both bride and groom's heads while they read prayers, directed by a priest. Arranged marriage in Chinese culture is about more than just finding an accomplished girl and creating favourable alliances - the heavens also need to look kindly on the match. In ancient custom, the prospective bride's birth date and hour were written down and placed on the groom's family altar for three days. If nothing untoward happened in that time, they were pretty sure it was safe to marry. Modern brides ask fortune tellers to check their birth date in the almanac - it's considered very bad form to buy a copy and look it up yourself! Red is the colour of marriage in China and finds its way into everything from the bride's gown to the gifts of money handed out by the groom to his wife's friends, which are wrapped in scarlet tissue. Wedding gifts are presented in red baskets and boxes, and red decorations bedeck the happy couple's home on the big day. One of the more unusual customs is for couples to marry after the clock strikes the half-hour, so the hands of the clock are moving up rather than down during the service. This is thought to help the couple begin their lives on an 'upswing'. Something you mightn't expect in a culture not famed for its desserts is the tradition of a huge, multi-layered wedding cake, symbolising a ladder to help the newlyweds ascend to success. Once it's cut, the happy couple intertwine their arms to feed each other the first piece, while trying to keep the bride's elaborate make-up intact. If you can get through that sort of difficulty without a row, you'll make it through anything!